MY UNPROCESSED FOOD FAST concludes, but the freeing lifestyles choices shall continue! 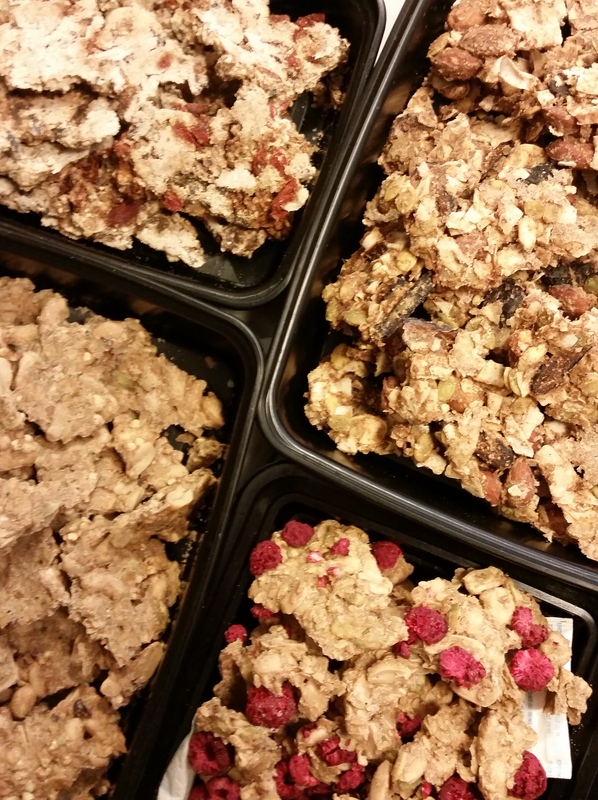 Just sharing that I just made several batches of the best at home, raw, soaked, and dehydrated high-protein and healthy fat granola ever!!! My previous post has the directions, so I will just list the ingredients in the various kinds I concocted and am sharing and enjoying immensely!!! 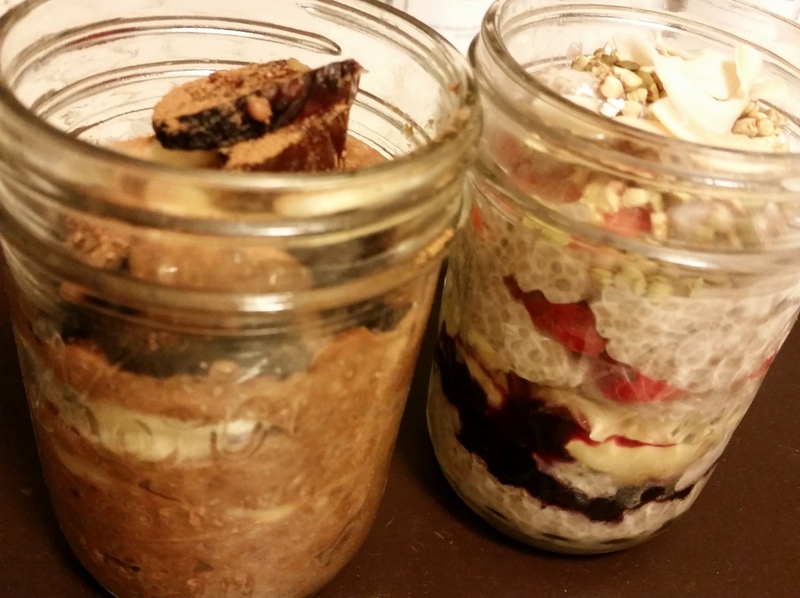 4 versions of RAW Granola…ROCKED IT! 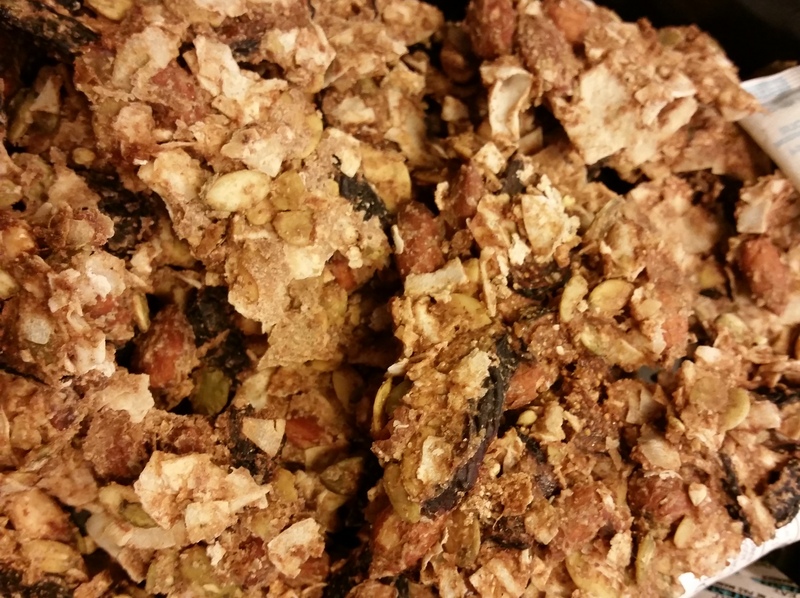 RAW, SPROUTED, DEHYDRATED NOT SWEET SUPERFOODS GRANOLA! cannot go wrong with this one! 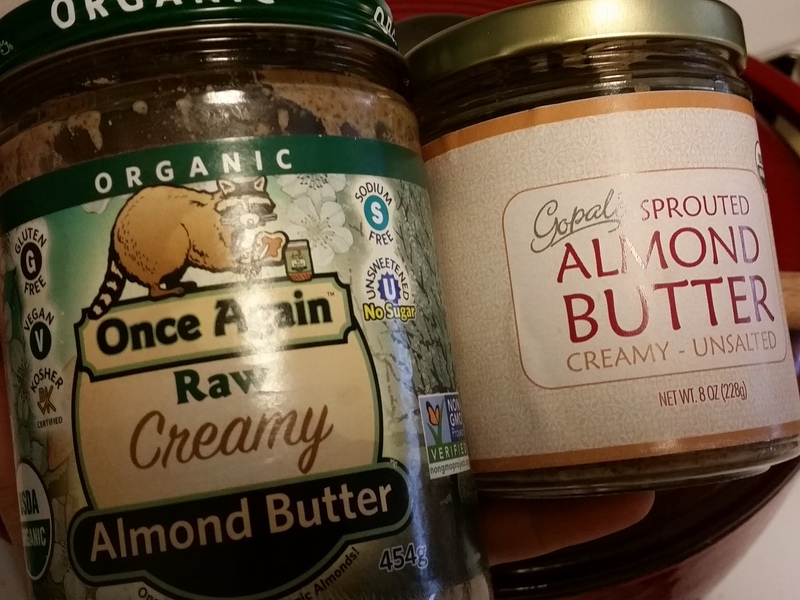 1/2 cup of sprouted, dehydrated almonds and 1 heaping tablespoons of raw, sprouted almond butter. 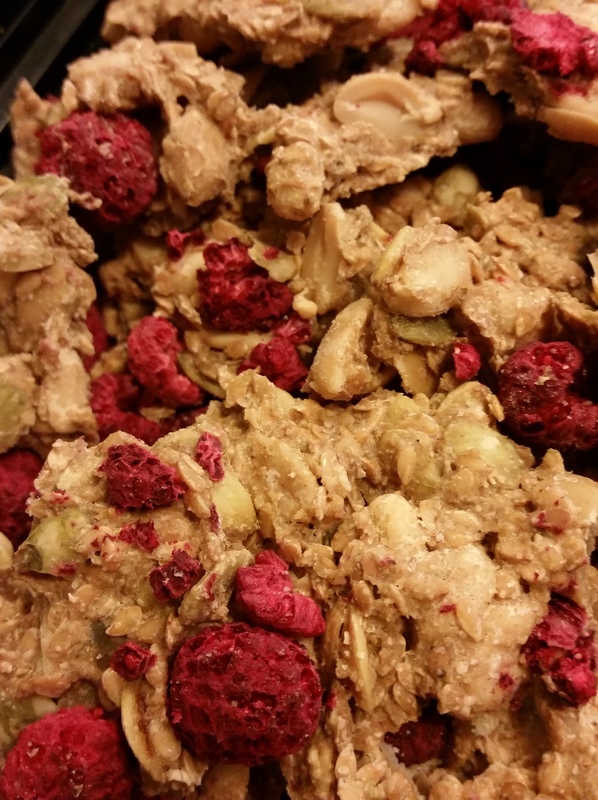 MACA BERRY POP -do the peanutty version and then add maca powder while mixing ingredients and place freeze dried raspberries onto the batter after spreading the mixture onto your teflex sheets. NANA LOVES CACAO -back to the peanutty version, but instead of using dates, mix in mashed banana to sweeten. I would recommend at least one large, ripe banana so the flavor is present and not too subtle… Cacao nibs are great in this as well as the mesquite powder. 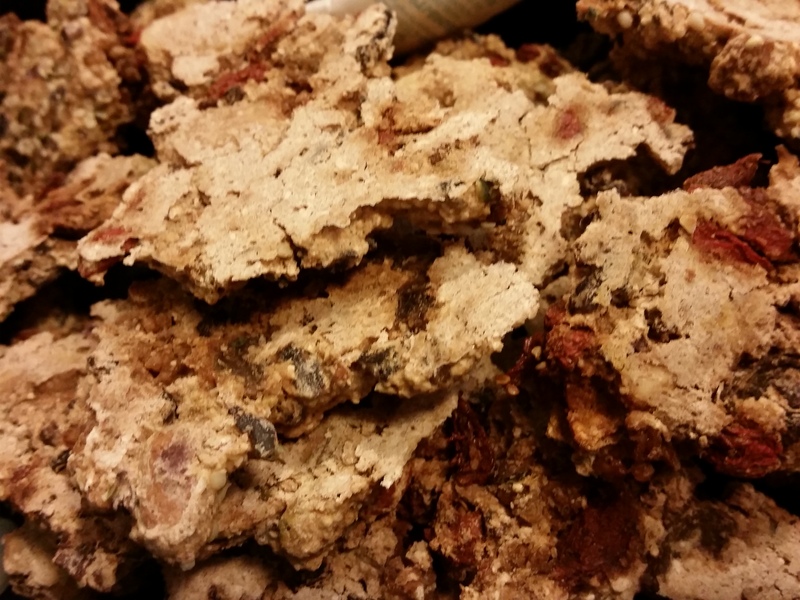 I laid this down thick to make it in a brick-like granola for specific use in a yogurt. 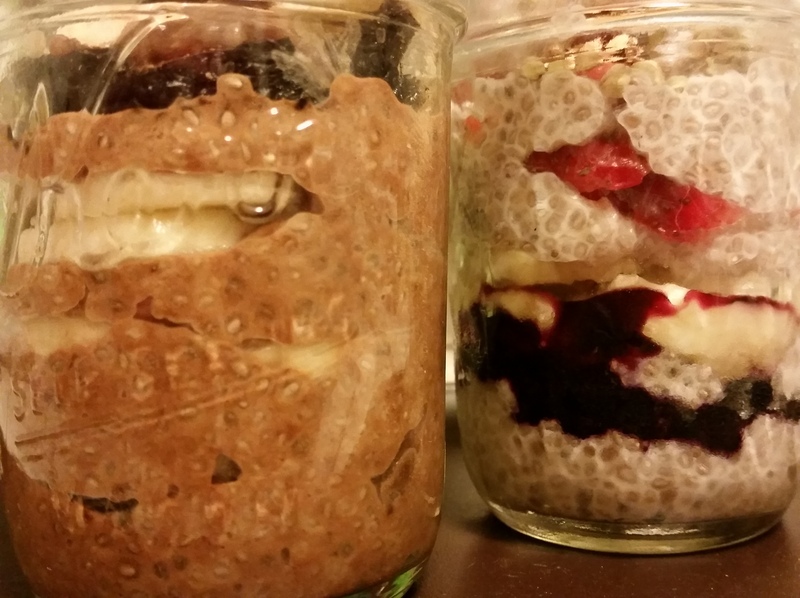 Chia seeds, preferably white, soaked in coconut cream with added cinnamon layered between sliced berries or between dates, nuts, and more banana… I also let the chia soak in carob powder as well as dates for the decadent “chocolate-y” version. Feel free to use real cacao powder and nibs for extra pow! 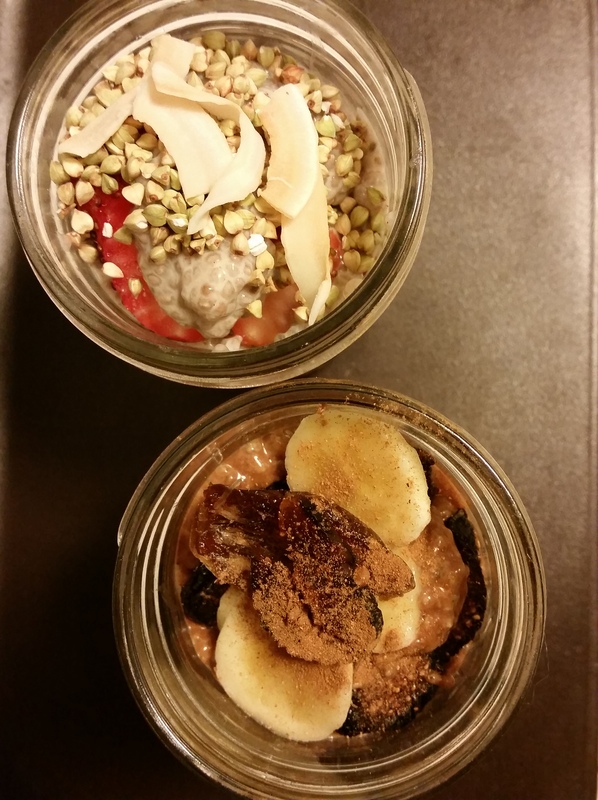 Having the pudding around also makes a great thickening agent for your superfood smoothies! UNPROCESSED, THE FAST. WEEK #4. My recurring thought toward the end of this Lenten Unprocessed Food Fast is that I AM HAPPY SAYING NO! The food industry with shelf-stable taste-addictive offerings has lost its moderate hold on me during this mindful practice… and I am blessed. Don’t get me wrong,I have to stay vigilant while allowing myself the enjoyment of living and eating the fatness of the earth, but knowing how much our living planet has lost and been sacrificed in the name of our voracious appetites makes it just a bit easier when conscious compassion rises up. What hit me this week… that the deeper issues usually covered up by addictive foods (i.e. my crutches) are making themselves quite known. All my childhood life this was the one thing I could do that would bring verbal recognition from my parents… that their daughter eats a lot and often out-eats anyone at the table. I did that for most of my life and only escaped obesity by a fluke of metabolic blessing… but as I have been told, my digestive system is run down and sluggish and my intestinal track rather unresponsive. So, I pay the price for a lifetime of gluttony in more unseen, but no less heavy ways. In accepting a gracious hosts’ invite to dine at their home with a course meal designed for those not fresh off a juice cleanse, my hubby and I attended because we were promised my food concerns and mindfulness efforts would be accommodated with plenty of vegetables. Well, I am proud to say I successful and as gracefully as possible declined the wine and dessert and the first course with crackers that undoubtedly had some processing involved, I still did inhale my entire extra-large portion of an organic young land animal (let me leave it at that.) It was mild, tender, and delicious, but I really could and should have brought home half of my serving. The only veggies in sight were in the sauce that served as a base alongside risotto. I served myself extra of the stewy veggies. 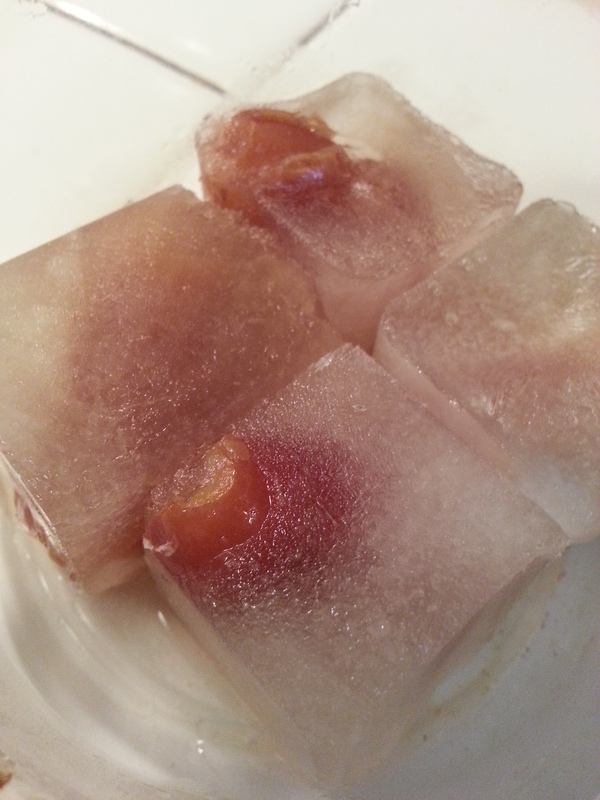 I was beyond stuffed after the stark contrast of luscious juices I thrived upon for several days prior. wow… What I learned: that everyone has a different interpretation of food in general and “plenty of veggies” in particular… and I have (and continue to have) a hard time saying no to too much food. *sigh. 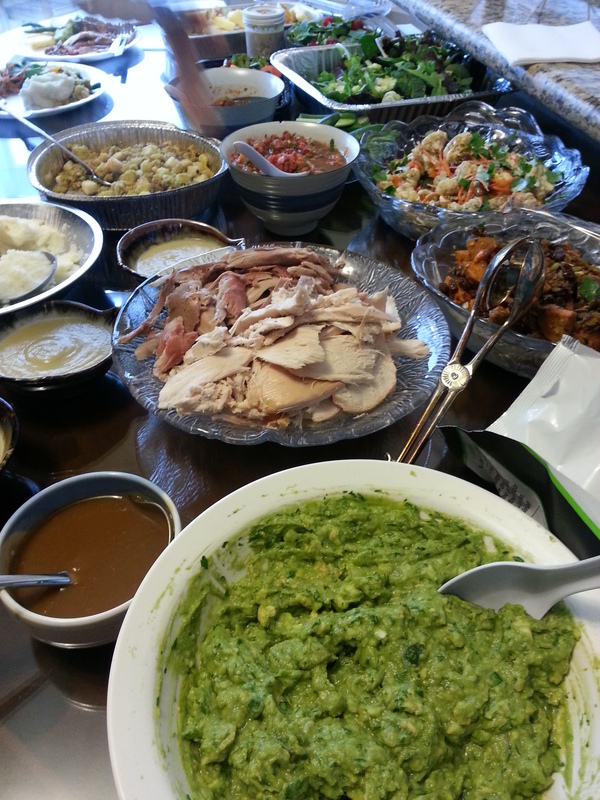 I popped some digestive enzymes and focused on how grateful I was to have enjoyed such rich foods with such generous hosts and wonderful couples. Lesson revisited so that I can stay mindful that this is an ongoing process of learning and continued mindful modification on what I allow to fuel me. Just a week later… minor, yet MAJOR VICTORY!!! And there’s some larger movement parallel to my personal one… goodbye Cheez Whiz! 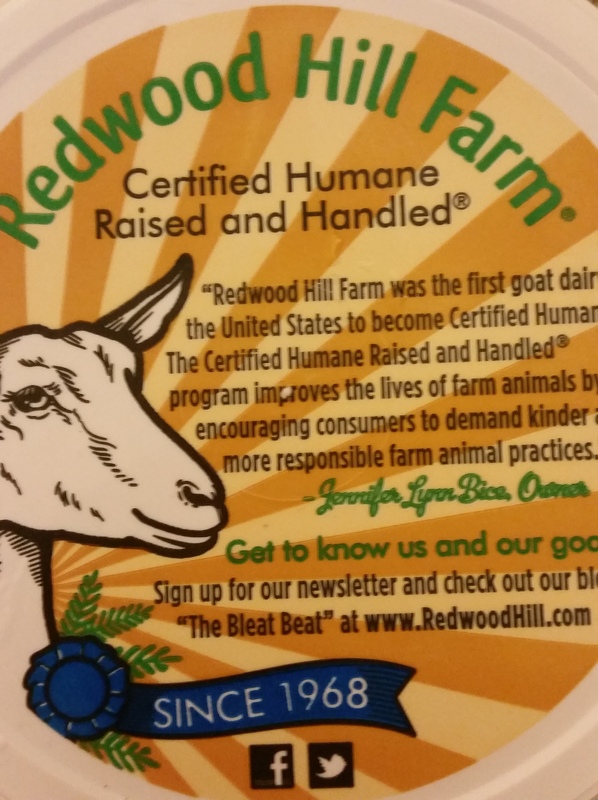 If you don’t know about this company, you should… it’s the first certified humane dairy farm in the US! 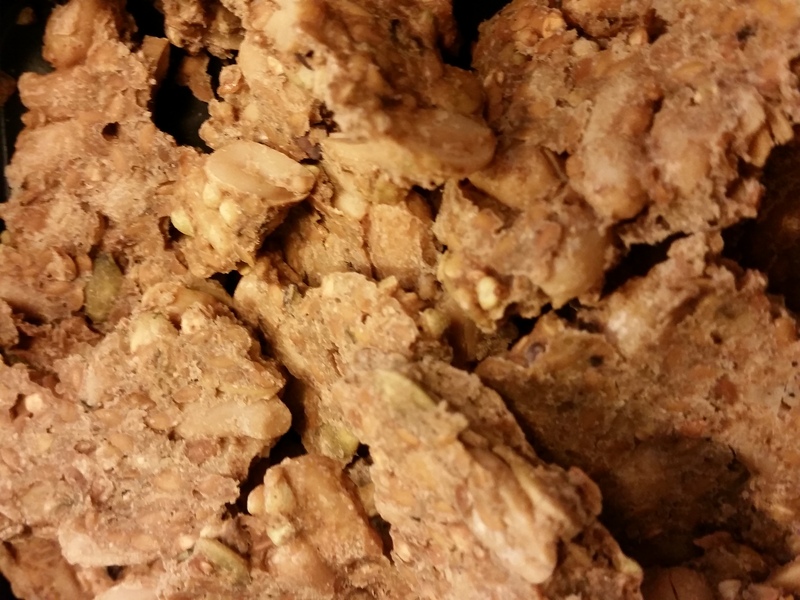 Marching toward Passover/Resurrection Sunday… and recipes to share abound! I was wondering about what this label means…glad my fast prodded me to find out more! WEEK ONE OF FAST FROM PROCESSED FOODS.-making just 1 observation a day. DAY 1 – SHOPPED TO RESTOCK KITCHEN WITH BETTER CHOICES. It’s become such habit to reach for those baked “healthier” chips and such, but they still have added sweeteners and such even though they are whole grain, not-fried, and not as bad across the board. Still, if there is added sweeteners, I want to know about it and avoid it. Lots of raw kale chips fill my cart as well as fermented probiotic drinks from various kombucha lines..and of course, organic produce. After Lenten season service, hubby and I go to have italian style pizza as the last hoorah before I buckle down… order came out wrong and way too salty for some reason ;/ …guess I shouldn’t have. DAY 2– OOPSIE! Right after I post my Fast guidelines, i tear into a bag of raw kale chips and think on how extra crunchy it is. Lo and behold, this flavor has added coconut crystals.. dang. Their other flavors don’t. 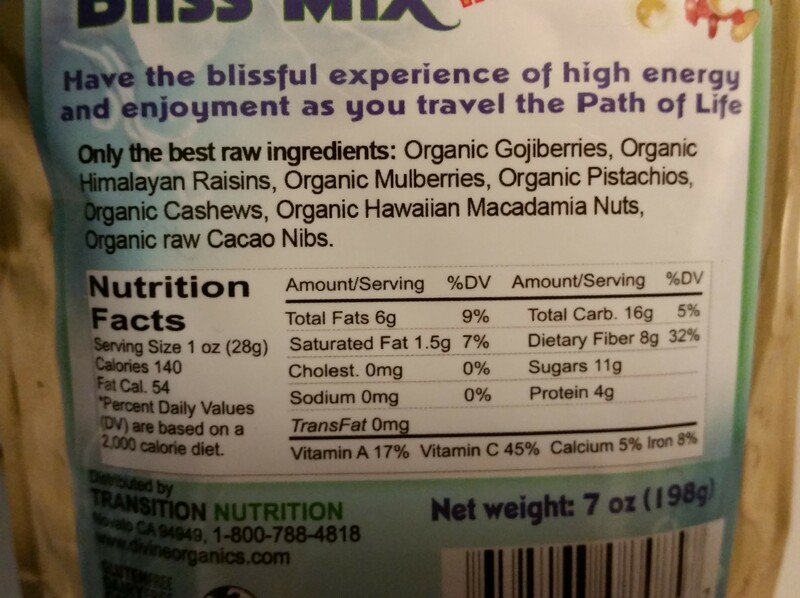 Goes to show me that i have to read every label and not presume that health-food raw snacks aren’t dosed with the extra-stuff I am working on avoiding. DAY 3– REALLY GOT CRAVINGS TODAY… not necessarily for flavors, but for the action of chewing and crunching that I just enjoy as a pastime. I allow myself a 1/2 bag of raw kale chips without any sweeteners and all whole food ingredients only and then dried digs and chocolate nibs, too… Almost added honey in to my chai tea latte made at home with variety of herbs and such, but opted to just allow the goat milk to sweeten it. It is sweet enough. Milk has a sweet index of 15 out of a 100, which is where refined sugar is placed. I keep wanting to just snack and chew. Combating that with prayerful quiet and breathing times. DAY 4 – I CAUGHT MYSELF reaching for chips at a sports event. 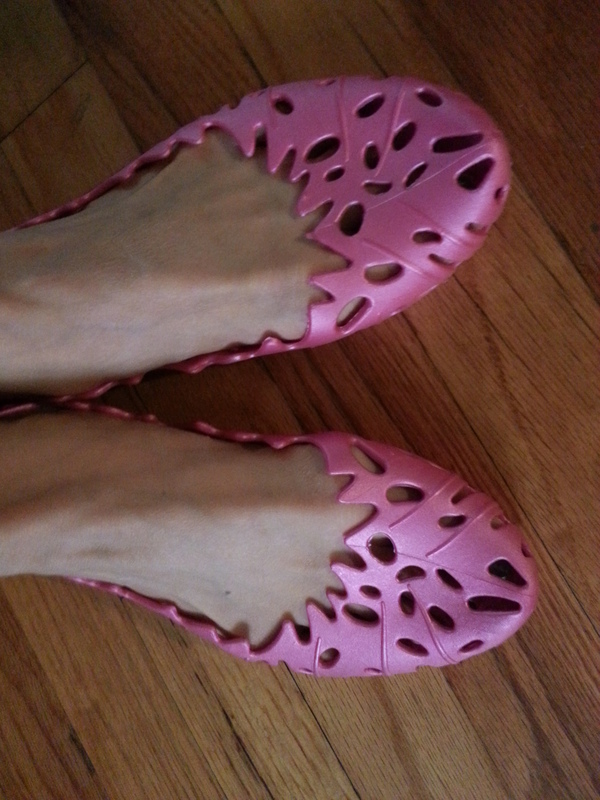 Recoiled at how mindlessly I grabbed at something without thinking just because it was available. I am such an endless, often indiscriminate grubber! Enjoyed a full cup of#healthyfat in guacamole by the spoon instead and was fully snack-isfied!!! Really hating how hard it is to avoid processed edibles with additives and preservatives. A nice big, veggie-based Korean dinner followed. Nice, but wished the meats were organic so I could consider eating them. ;/ #farmersmarkets rock! 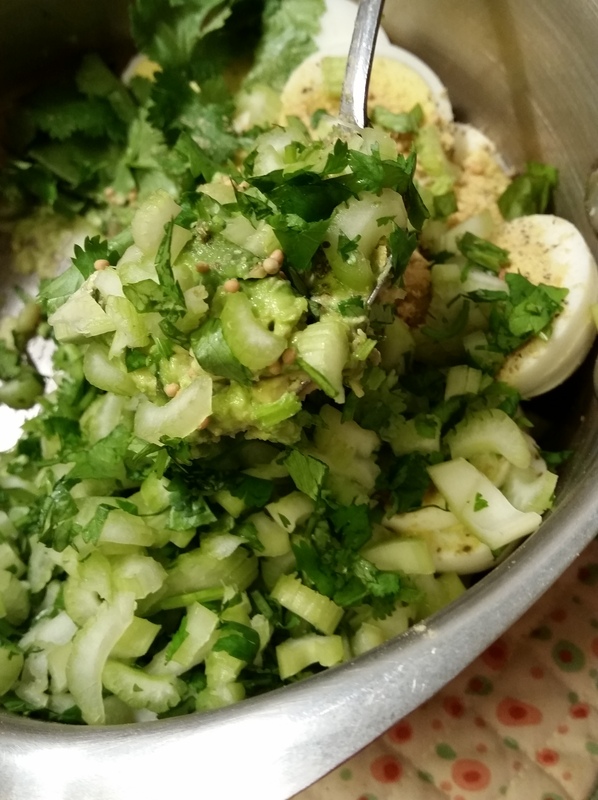 DAY 6 – Hooray, I don’t need mayo for my egg salad!!! Instead of mayo… even the healthier options have sweeteners… I used olive oil and ripe avocado..and it was deliciously different! DIRECTIONS: Mix up all the ingredients and add more olive oil or avo as needed for creaminess preference. Best enjoyed immediately. These simple Ingredients proved their worth as a great substitution — rather tasty, but less addictive! I surprised myself with just how much since I really do love grapeseed oil Vegenaise for typical use. Honestly, when I use mayonaise, I find it hard to portion my foods and end up gobbling up all of the creamy dish! DAY 7 – It’s imperative to have pre-made snacks and mini meals on the go to successfully combat the convenience of processed foods in ready supply everywhere! This is worth saying again… dwelling upon. 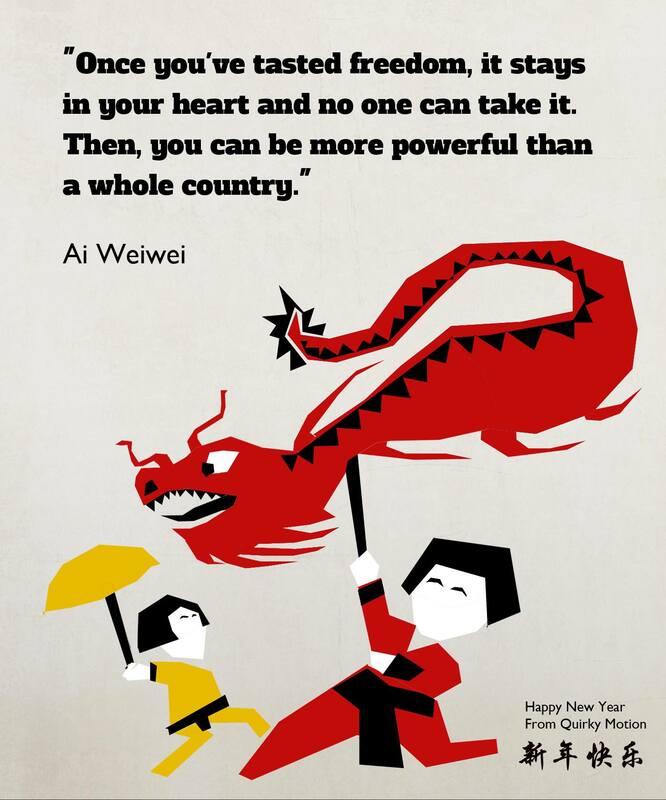 Entering the Lunar New Year and this Lenten season, I choose to walk out this incredibly potent period of confluence with mindfulness and making deliberate choices. This is not the typical fast for me where I hardline what I can and will not have, but rather, it will be one of allowances and finesse. 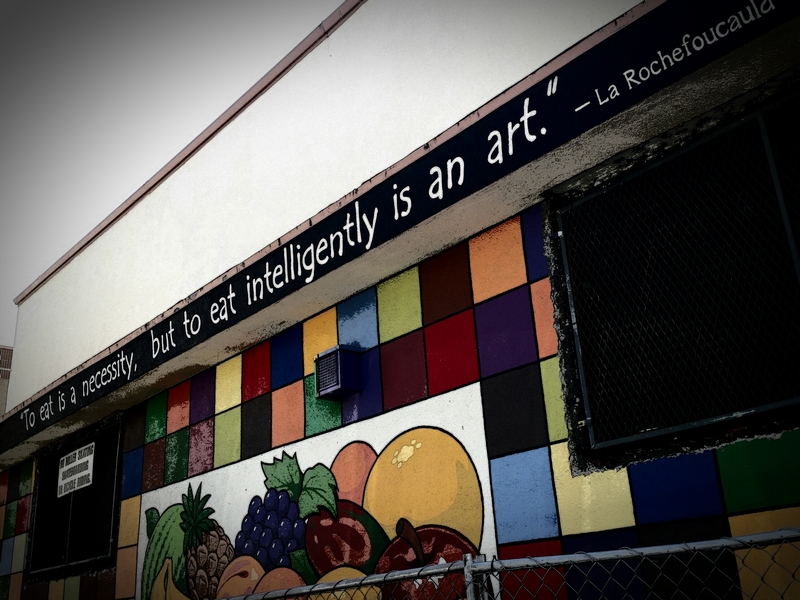 Well, I am choosing to practice artful eating by opting for real foods that have not been touched by man’s “food” conveniences. Yes. I will get to see how deeply reliant I am on commercialized, processed, and pre-packaged foods and examine the effects of the food industry’s agenda upon mine. Do you know just how powerful the 1 trillion dollar food industry may be in its impact on you and your wellness? Well, I will have you ponder upon the startling statistic that the effects of our food choices have resulted 1.4 trillion dollars spent on health issues caused by the foods we eat. Consider who is truly ruling your eating choices–you or a monstrous power parading about through low-fat, tastier, addictive, sugar/preservative/toxic-laden consumables? Does most of what is on the average grocery shelf really classify “food” nowadays? Before I get myself too worked up… I am simply saying I am planning to consciously fight the numbing ease of commercialized, convenient consumables by weighing such costs and get myself into a better practice by opting for recognizably real food…food closer to the earth from which it was grown. There are so many larger forces at play and I refuse to be bullied about by them… as much as I am able to make a difference in at least my life (and hopefully my husband’s and dog’s.) It may not be easy, but I will be made more aware and freed by the effort itself. 2- food should be recognizable from the source it is from… (that means most breads are off the table, unless they with sprouted grains, with no sugars added, and full of fiber. Raw breads would be ideal.) Deep fried foods are not worth choosing to eat. Re-think fast food! Go for an apple, instead of a snack bar. 3- no additives or sweeteners unless from whole food source like dates (stevia if already in a vegan protein, for example, is permissible.) Sea Salt in moderation is good. 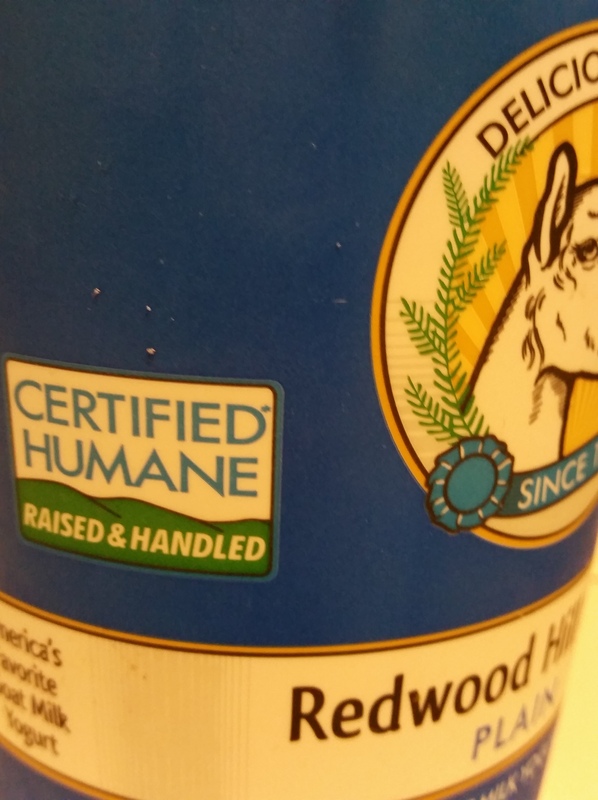 4- when eating animal flesh, or any animal-sourced food (yogurt, eggs, milk) inquire into and eat only organic, free-range, sustainably wild-caught options. Did you know vegans “save” 100 animals each year? 5- if eating out, always ask for organic options in produce and protein choices…and even ask about making the dishes without added sugars and especially the neurotoxin MSG. Prefer olive oil & vinegar as a dressing. 7- explore the gorgeous array of edibles offered through creation and remember that the better I acknowledge and appreciate all living creatures, I will be that much more deeply nourished and part of more mindfully stewarding all life sharing this planet. 9- stay grateful that I can make such choices. Why this type of fast? … mostly for the practice of walking my faith step by step acknowledging the wisdom of my Creator in the most simple act of eating intelligently…consuming spiritual, soulful, and physical sustenance in a way most responsibly, expecting to be a blessing and be blessed along the way. Liberation comes from discipline and how wonderful it shall be to walk out this freeing season in newness! Join me if you would like… and share your journey with me. Want just a quick reset to get your mind and gut primed to take in more nutritents AND desire more nutritionally dense foods after letting yourself “go” for a while…like me? After 5+ weeks on location for a film shoot and eating only healthful, GF, no sugar, highly nutritious foods–mostly organic and vegan, with the occasional wild-caught low mercury fish, I treated myself to a month+ of eating whatever I wanted, whenever I wanted. 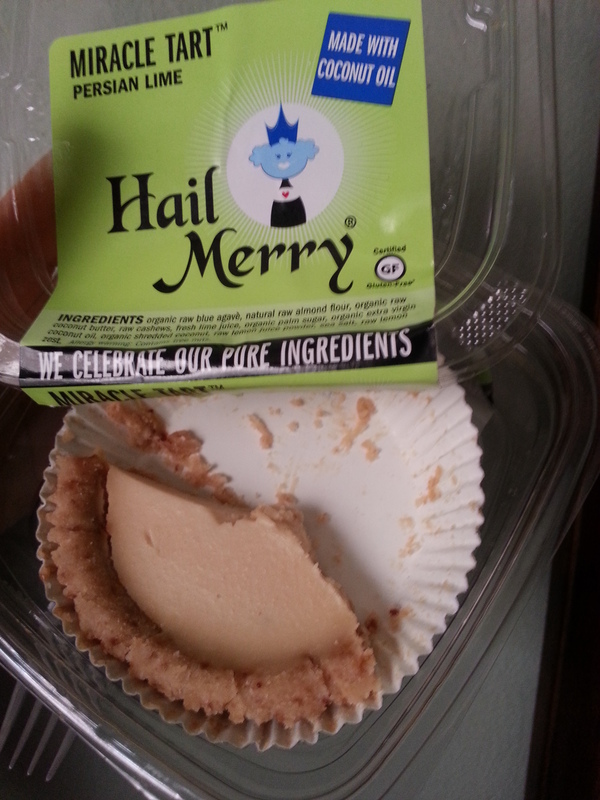 Not really a treat since I felt icky during and after the eating soirees… the cravings got the best of me where I didn’t really want what I was eating as much as I just wanted to eat… the culprit? Sugar… Yup. For me, sugar–the awful refined white addictive sweetener that open the watershed of cravings in a mighty scary fashion. 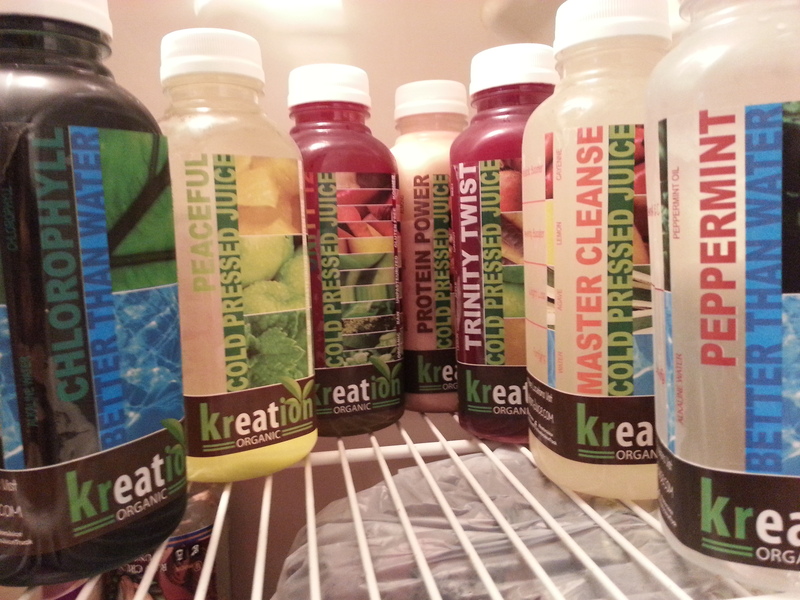 Tired of my munchie self, I had one full day of just wonderfully health-giving juices from Kreation Juicery.. I LOVED IT!!! DELICIOUSNESS!!! Just their basic level 1 was enough to get my taste buds wanting the good-for-me stuff.. I just wanted more juice…and it reminded me of when I went for a 30-day cleanse and how I was truly satisfied with the sheer nutrition experience. AND IT’S AWESOME THAT WHEN I DECIDE TO MAKE BETTER CHOICES FOR MYSELF, THOSE AROUND ME BENEFIT. MY DOGGIE ROCKY THE RESCUE WANTED SLURPS OF MY JUICES, TOO!!! SO, I LET HIM ENJOY CAPFUL AFTER CAPFUL… I was very pleased and cheered him on. Eating, as expected, has been rather anticlimactic but I did not expect the blah blah feeling about the tastes of foods to last for days! Still, I could not eat but a fraction of the gobs of servings I used to stuff in my mouth before the fast. How odd and wonderful. I like feeling how my tummy feels instead of just going numb and just continually stuffing without much remorse or cognizance. 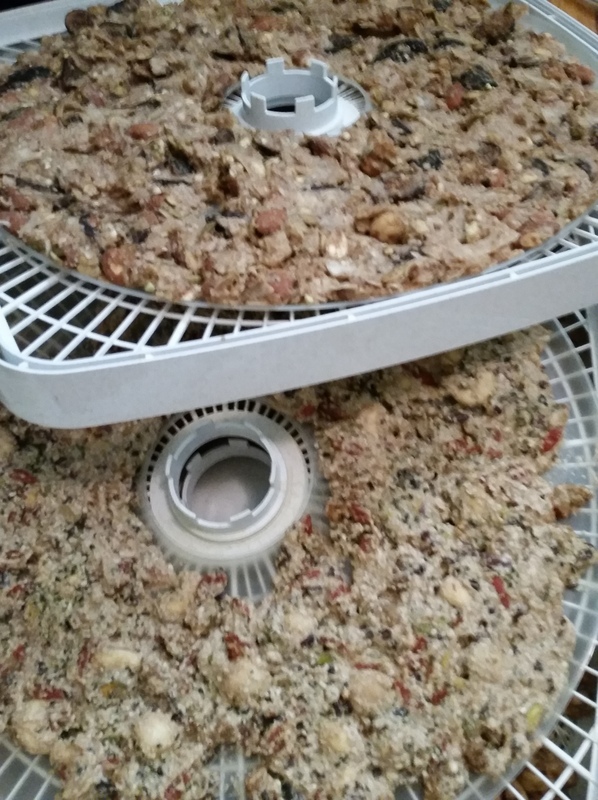 Plus, I want more living foods… eating my leftovers from Native Foods left another blechy coat on my tongue that I tried to cover up with other foods like dates, dried figs, and ending up eating more desserts to help. I am looking forward to having a meal at Lyfe sometime soon. They do not have a fryer and serve foods in the correct portions which most Americans find too small… but it is the excessive abundance in our country that is what is truly askew in my opinion. I think I will juice tonight– gaia melon, leek greens, cucumber, and a bit of cucumber… I really do miss the richness of flavors in freshpressed juices–nothing compares!!! I think my body misses the nutrient density and ease of assimilation, too….